My Dad served in WW2. While I was growing up, he used to love to tell stories about his experience. 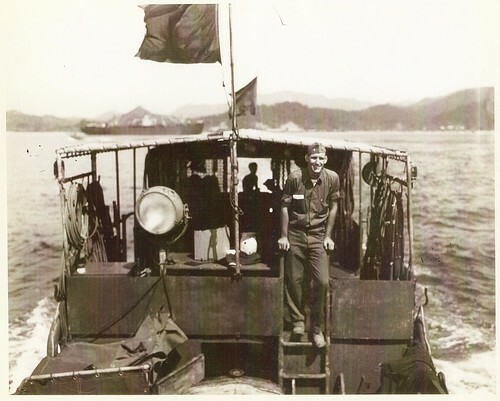 He’d park himself on his favorite chair in the living room and tell story after story about his experience being stationed in the Philippines or his time in San Francisco before being shipped out to duty. A few years ago during a Veteran’s Day Celebration in my home town, my Dad was honored at a ceremony and was asked to speak about the important role of vets. He shared a story about one of his missions in the Philippines about how he and other Navy men were able to salvage a church bell from the wreckage and give it back to the local village. My Dad is almost 90 now and still lives in the same house where I grew up. 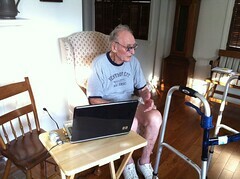 He has not been well lately, but now that he’s out of the hospital, he gets around on walker and is re-learning how to use a computer, a laptop from my brother. His benefits from VA cover his medical costs and expenses – so he worries what he’ll have to do if those programs are cut. My entire family worries too. Beth Kanter is co-founder of Zoetica and co-author of the Networked Nonprofit and writes Beth’s Blog. Hey Beth! Like you I’m totally in awe of the men (and women) who served in WWII. My Dad served in the Navy then as well, but interestingly has become an active member of Veterans for Peace in recent years. He has organized a group of friends and fellow vets to march in protest of the current wars, and they are out on the street every Friday afternoon (in Southern Cal) with protest signs and anti-war slogans. I totally in awe of that too…the service continues!